April 5, 2017 | April 5, 2017 | Mitesh P. Lotia, M.D., has joined the University of Arkansas for Medical Sciences (UAMS) as a movement disorder neurologist with a special interest in Tourette syndrome and will see patients in the Movement Disorder Clinic. Lotia is also an assistant professor in the Department of Neurology in the UAMS College of Medicine. In addition to treating patients, he will conduct clinical trials, engage in community awareness and help nurture future neurologists. Tourette syndrome is a genetic neuro-psychiatric condition that begins in childhood and is characterized by multiple repeated tics. They can be involuntary vocal sounds or brief muscular jerks. Over time, they can change in type and frequency. Tics can involve different areas of the body like the arms or legs, having a debilitating impact on daily activities. Lotia came to UAMS after completing a fellowship on movement disorders and Tourette syndrome at Baylor College of Medicine in Houston, Texas. Tourette syndrome is one of many conditions treated at UAMS’ Movement Disorders Clinic, including Parkinson’s disease, essential tremor and Huntington disease. Lotia earned his medical degree and completed an internship at the Terna Medical College in Mumbai, India. He completed internships at Union Memorial Hospital in Baltimore, Maryland, and the University of Louisville Hospital in Louisville, Kentucky. 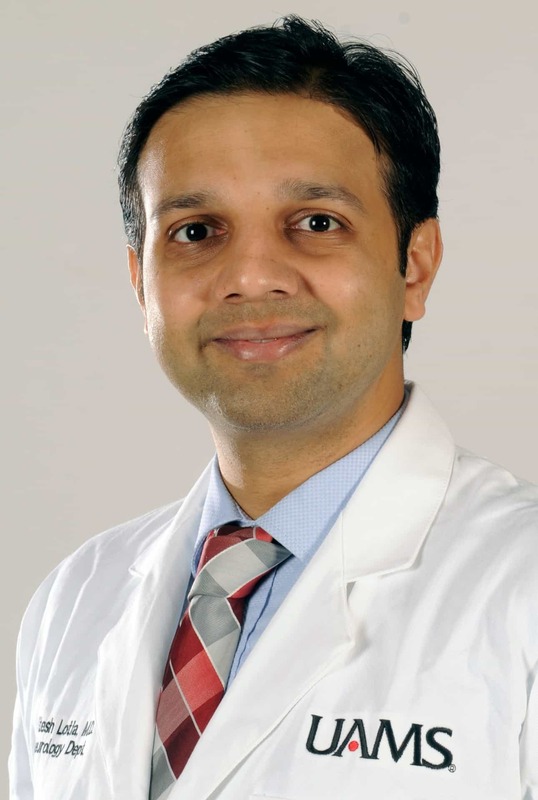 He was a clinical stroke fellow at the National Institutes of Health Stroke Team at Washington Hospital Center in Washington, D.C., and a neurology resident at the University of Louisville School of Medicine, where he also served as a chief resident. He is a member of the American Academy of Neurology, International Parkinson and Movement Disorders Society, American Medical Association, Education Commission of Foreign Medical Graduates and Maharashtra Medical Council.